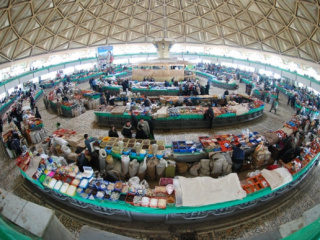 Nukus is a historic city in northwest Uzbekistan, close to Khiva and the Turmenistan border, and is one of the fastest growing cities in Uzbekistan. Although Nukus itself was founded in the 20th century, the region dates back to the Stone Age. The area around the present-day cities of Nukus and Khiva was a kingdom in the 6th-7th centuries B.C., and today interesting archaeological finds are located only a few miles outside of the city. The archaeological complex of Mizdakhan, on three local hills, reveals the ancient settlement of Ghyaur-kala, which survived until tribes from Mongolia invaded in the 1200s. This settlement, near where Nukus stands today, was a major trade and art center of ancient Uzbekistan, and the Silk Road passed through the town. Central Asia is home to the Zoroastrian religion, and it is thought that Zoroaster originally wrote and taught in another archaeological find near Nukus. NukusVisitors like to tour Nukus to see historical monuments such as the country palace Kirk Kyz, Ayaz-kala, the Ishan-kala mausoleum, and the ancient community of Toprak-kala. Toprak-kala was a mansion of governors, and stands as a palace with mural-painted halls, sculptures of local rulers, and figures in masks. Another interesting complex is Mazylmkhan-sulu, an underground mausoleum from the time of the Mongolian invasion decorated with blue patterned tiles that were only made in the area. 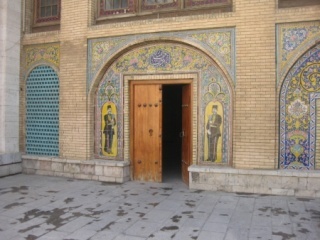 Near the mausoleum are the ruins of a madrassah, or Islamic school, also from the Mongolian conquest. Travelers to Nukus cannot miss a tour of the Nukus Museum of Art and State Museum. The museums show art and objects from the local area near Nukus and from Uzbekistan at large. The Nukus Museum of Art is famous for its collection of early 20th century art from Russia and Uzbekistan, including the second-largest collection of Russian avant-garde in the world. The wonderful art collection was saved from Stalin because of the the remote location of Nukus and because of the work of the founder Igor Savitskiy, who studied at the Moscow Art Institute but was evacuated to Central Asia during WWII. The State Museum shows archaeological artifacts, jewelry, costumes, and musical instruments from Nukus and other areas of Uzbekistan and Central Asia. It also houses exhibits on the environment, including extinct and endangered plants and animals and information on the shrinking Aral Sea. The broad avenues with large public buildings combined with incredible archaeological finds, historic monuments, and two major museums makes Nukus a wonderful tour destination in Uzbekistan.